Thanks to Dr. Snehal Sonawane, Dr. Kyle Meinke and Dr. Asya Ali, University of Illinois Hospital and Health Sciences System (USA) for contributing this case and discussion. To contribute a Case of the Week, follow the guidelines on our main Case of the Week page. (1) Last week, we posted another article on our Management page, Several Pathology Codes Could See Significant Cuts Under Proposed Medicare Fee Schedule by Mick Raich, Vachette Pathology. (2) Are you getting our emails? Add NatPernick@gmail.com to your SafeList / Address book, so our email subscriptions go directly into your inbox. (3) Please bookmark and use our Amazon.com link to remember to shop at Amazon.com, and at the same time, help PathologyOutlines.com. 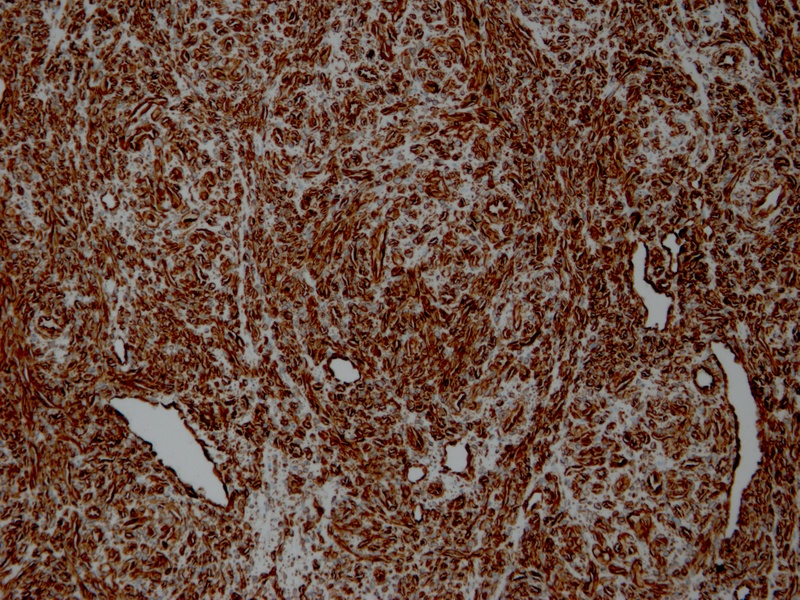 We receive a commission (~ 5%) from all purchases made through this link, whether pathology related or not, at not cost to you. You get the benefit of wide selection of products and sellers, product reviews, a low price, and the knowledge that you are helping us maintain and expand our free website for the pathology community. In addition, we donate 10% of the commission we receive to charity. A five week old, full term boy presented with respiratory distress, URI symptoms and thrombocytopenia. Chest CT showed pericardial effusion, cardiac tamponade and a supracardiac soft tissue mass, 2.9 x 2.4 x 1.1 cm. 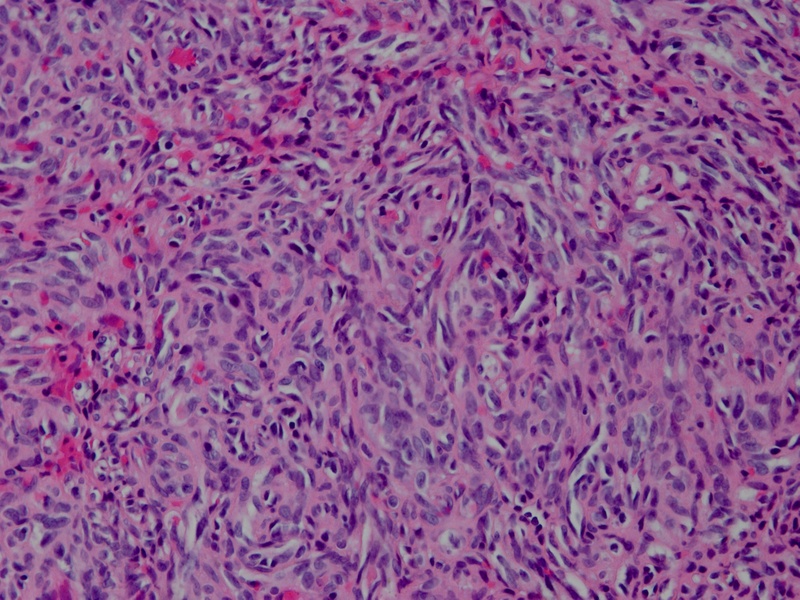 He had a mediastinoscopy with excisional biopsy. 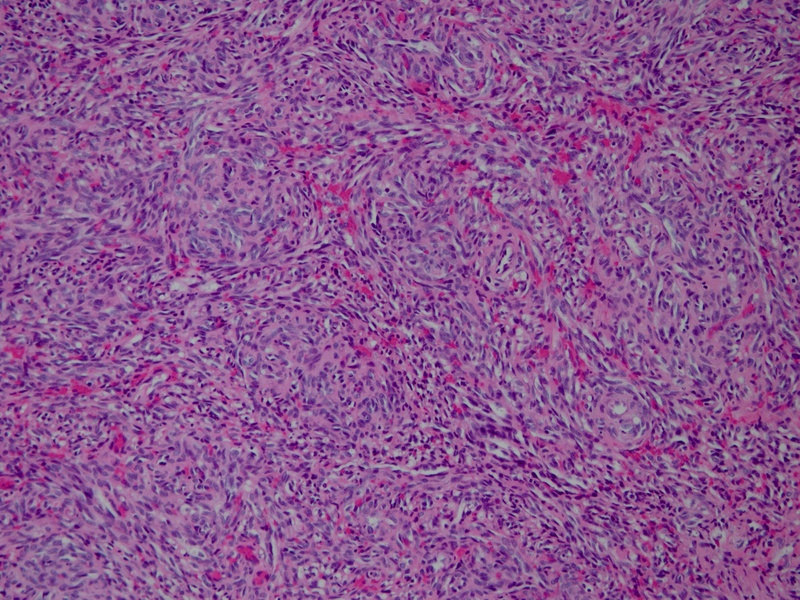 Microscopic examination shows a cellular tumor composed of bland spindle cells in a fascicular arrangement with vasoformative slit-like lumina and extravasated red blood cells ("kaposiform" morphology). 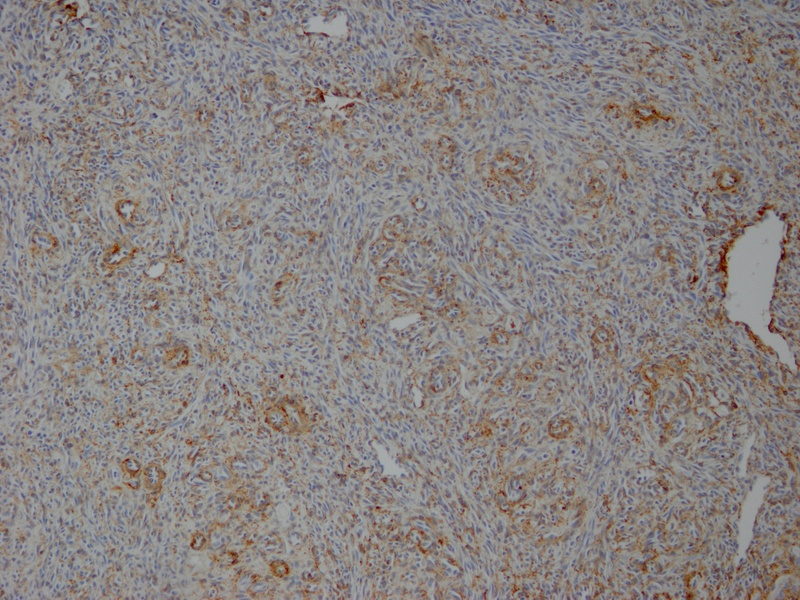 The tumor cells were positive for CD31, CD34, SMA and vimentin, and negative for desmin, myogenin, CK AE1/3, EMA, S100, synaptophysin and HHV8 (stains not shown). 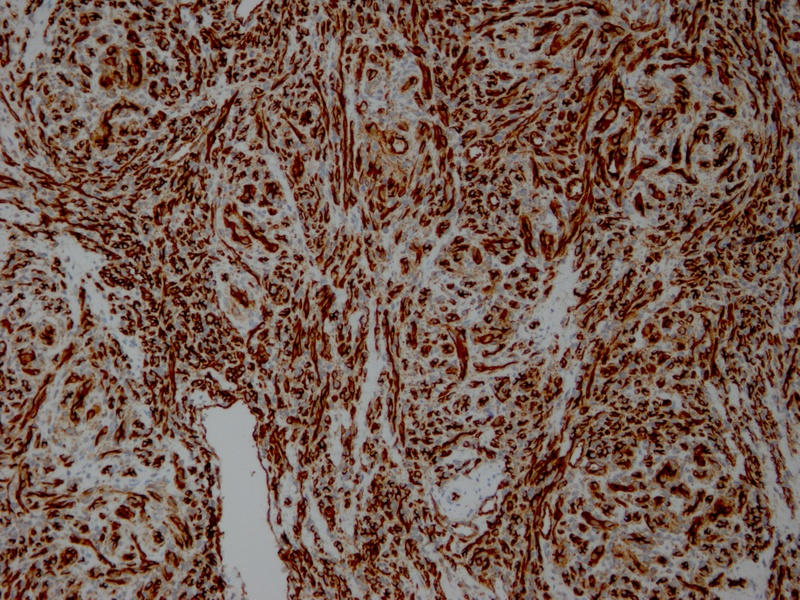 Ki67 was positive in ~15% of the tumor cells. 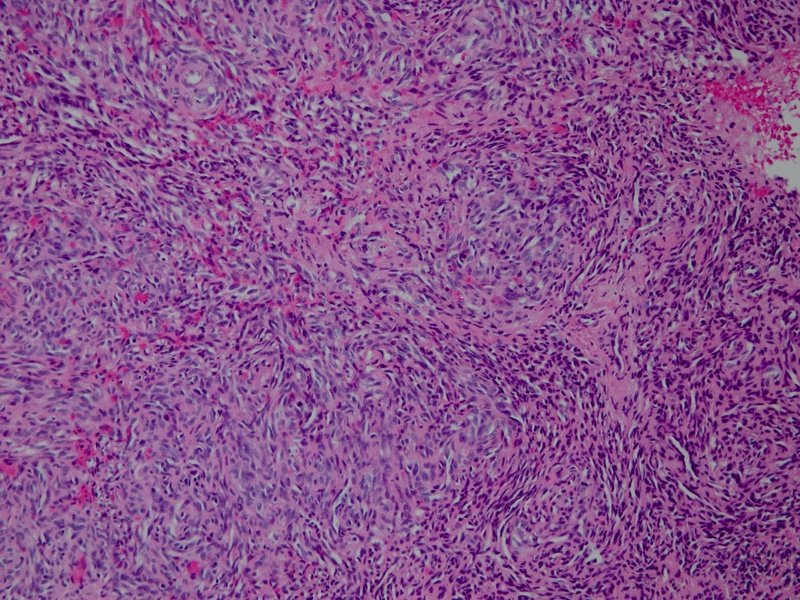 Kaposiform hemangioendothelioma (KHE) is a rare, locally aggressive, immature vascular neoplasm of children. The usual presentation is a violaceous skin lesion, but it may also present viscerally, typically in the retroperitoneum or mediastinum (Arch Pathol Lab Med 2004;128:678). 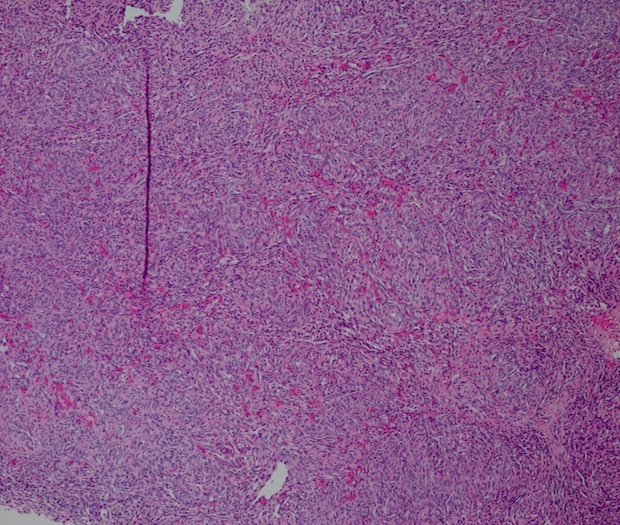 KHE may be associated with Kasabach-Merritt syndrome, in which platelet trapping and hemorrhage occur within the tumor, leading to a potentially life threatening thrombocytopenic coagulopathy. First described in 1940, 200 cases have now been reported (J Indian Assoc Pediatr Surg 2012;17:33), typically within large visceral lesions (Arch Pathol Lab Med 2004;128:678). Treatment of KHE consists of vincristine and anti-platelet aggregant therapy. Prognosis is excellent if thrombocytopenia is controlled (Pediatr Blood Cancer 2013;60:1478). 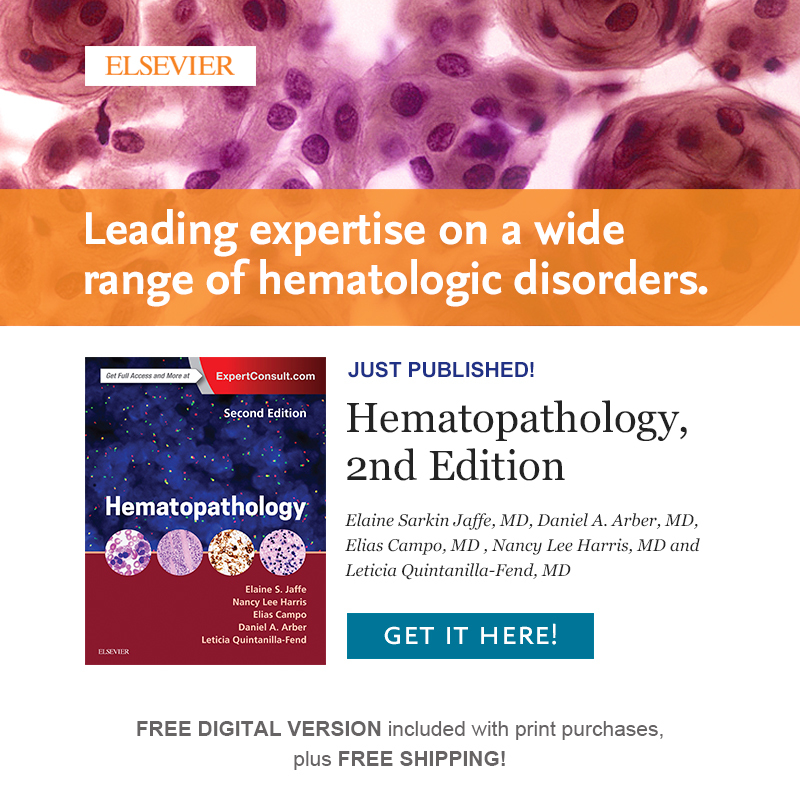 Multiple investigators have described successful pharmacological management with vincristine, ticlopidine and aspirin (Pediatr Hematol Oncol 2010;27:641). 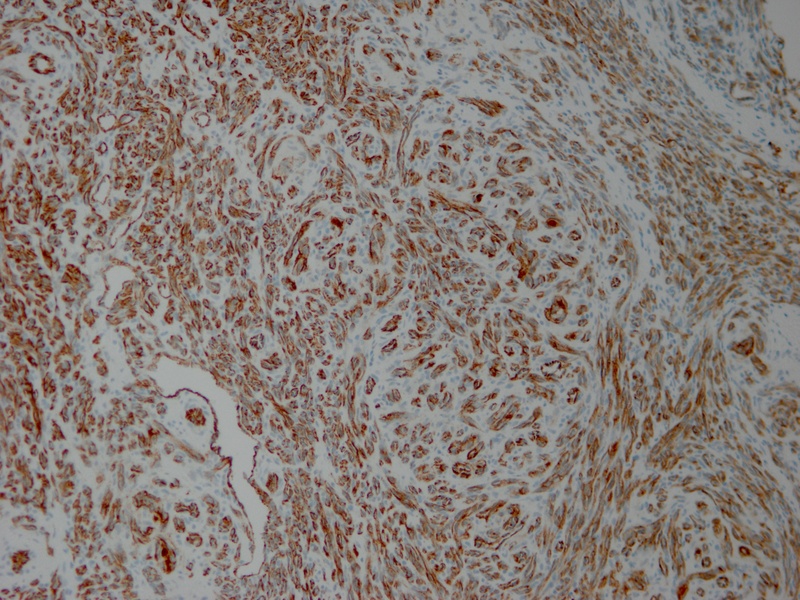 Recently, VEGF inhibitors and mTOR pathway inhibitors such as Sirolimus have been shown to be effective (Br J Haematol 2015;171:38). This patient was treated with vincristine and is doing well.